This morning, enjoy a leisurely breakfast at the hotel before exploring Ushuaia on a half-day city tour. Ushuaia, capital city of the province of Tierra del Fuego, is located on the shores of the Beagle Channel and it is surrounded by the Martial Range, which offers a unique landscape as a result of the combination of mountains, sea, glaciers and forest. The city tour will visit The Mission, Brown and Solier neighbourhoods, where you can see old houses belonging to the first families in Tierra del Fuego, such as the Beban, the Pastoriza, and the Ramos. Head 11 kilometres (6.8 miles) out of town to Martial Glacier. The ride in the chair lift to the trails leading up to the glacier provides wonderful regional views and of Ushuaia town, the Beagle Channel and its islands. Afterwards, continue to the End of the World Museum with exhibitions explaining the history of Tierra del Fuego. Transfer to the pier where our expedition team will warmly welcome you on board the Greg Mortimer at approximately 4.00 pm. As the Greg Mortimer pulls away from port, we’ll gather on the deck to commence our adventure with spectacular views over Ushuaia and Tierra del Fuego. You’ll have time to settle into your cabin before our important briefings. As we commence our trip across the South Atlantic Ocean, we make the most of our time getting comfortable with the motions of the sea. Our expedition team prepare you for our first landing with important wildlife guidelines and biosecurity procedures, and start our lecture program to help you learn more about Antarctica’s history, wildlife and environment. Our wildlife experiences begin as we enjoy watching and photographing the many seabirds, including majestic albatrosses and giant petrels following in our wake. They rise and fall skilfully, using air currents created by the ship to gain momentum. Located 477 kilometres (296 miles) east of southern Argentina, the Falklands~Malvinas is a unique mix of being a wildlife hotspot and inhabited outpost. An archipelago of over 700 islands, but consisting of two main islands, East and West, only seven of the islands are inhabited. The cold nutrient-rich waters surrounding the islands makes them a prime location for marine life, including seabirds and seals. Our time in the Falklands~Malvinas includes a short walk in historic Stanley town. Our experienced expedition team, who have made countless journeys to this area, will use their expertise to design our voyage over the next two days. This allows us to make best use of the prevailing weather and wildlife opportunities. In addition to Stanley, there are many exciting places we can choose to visit; a sample of some of the places where we may land, hike, and photograph or view spectacular wildlife include: Jason Island - rarely visited jewel and the most remote of all West Falklands islands. Saunders Island - rich in wildlife and history, the island boasts four species of penguins and a spectacular black-browed albatross colony on its northern cliffs. Carcass Island - a haven for small birds including endemic Cobb’s Wren, dark ground tyrants, tussac birds, and striated caracaras abound. West Point Island - home to numerous species of plants, birds and marine mammals, spectacular cliffs are a feature along the coastline, Sealion Island - an important bird area with Gentoo, Magellanic and Rockhopper penguins, Cobb’s wren, Magellanic snipe and tussac birds. 95 percent of the Falklands’ elephant seal population live here. 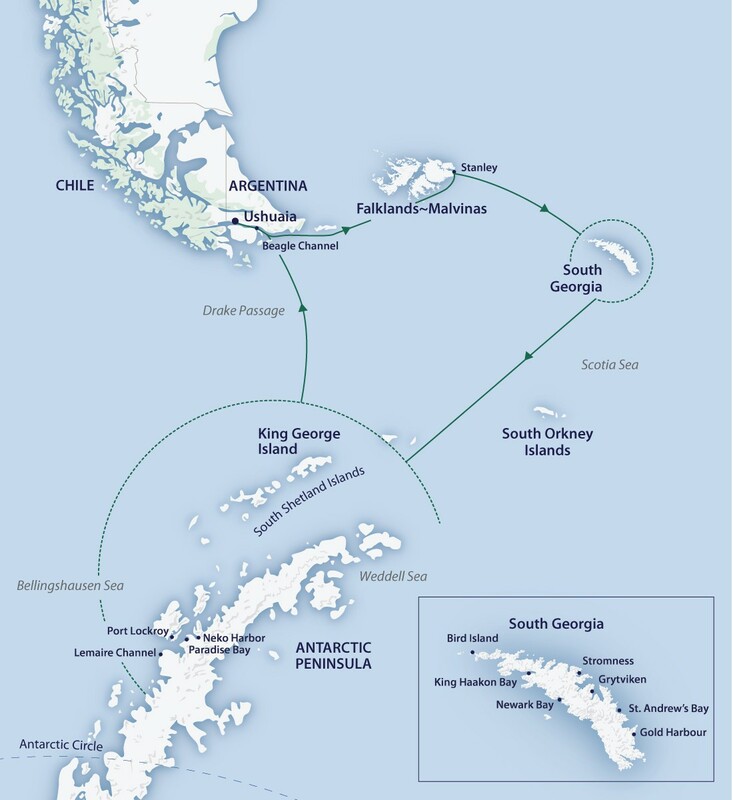 Between the Falklands~Malvinas and South Georgia, you will be entranced by the ceaseless flight of the many seabirds that follow our wake, skillfully using the air currents created by the ship to gain momentum. On this leg, we are usually travelling into the prevailing weather so it is difficult to estimate our precise arrival time in South Georgia. Our lecture program will continue highlighting all of the incredible sights we have witnessed over the past few days. You will have ample time to enjoy observing the sea birds, whale-watching from the observation areas, or simply relaxing with a book. If time and weather conditions permit, we may pass close to Shag Rocks, a fascinating group of jagged rocky islets protruding from the sea, in the proximity of South Georgia. Over the next few days, marvel at South Georgia’s incredible scenes such as enormous and bustling king penguin colonies, fur seals jostling for space on the beach, jaw-dropping mountain landscapes and learn of Shackleton’s epic rescue journey. On Zodiac-cruises, discover bays filled with raucous and playful fur seals, and land on pebble beaches to meet curious penguins. Challenge yourself on hikes and enjoy dazzling pristine landscapes seen by few. South Georgia is a place where you can truly feel like you’ve really escaped from your normal daily life. South Georgia is one of the world’s most amazing natural environments. Just a speck in the vastness of the South Atlantic Ocean, and lying wholly within the Antarctic Convergence, South Georgia and the South Sandwich Islands are a life-sustaining haven to some of the world’s largest congregations of wildlife. The surrounding sea is one of the most productive areas on Earth and supports the life of millions of seals, whales, penguins and other seabirds. A mountain range forms the spine of this long, narrow island. Between the mountains, shattered glaciers carve their way through tussock grass to the deeply indented coastline – a landscape that is synonymous with the epic expedition of survival by Shackleton, Worsley, and Crean. Abandoned rusting whaling stations and remnants of explorers reflect a time of long ago, while summer workers conduct scientific and regeneration projects. As we explore South Georgia, we will have the opportunity to reflect on Shackleton’s epic journey. If conditions permit, we plan to follow in Shackleton, Worsley, and Crean’s footsteps and complete the final leg of their walk from Fortuna Bay to Stromness. A sample of some of the places where we may land in South Georgia include: Grytviken - originally a Norwegian sealing and whaling station, it was finally closed in 1965. Sir Ernest Shackleton’s body was laid to rest at Grytviken. St Andrews Bay - the long black sandy beach fronts a broad valley that stretches well back from the sea. This valley shelters the largest king penguin colony on South Georgia. Godthul - imagine indented bays lined with bleached whale bones, teeming with fur seals and penguins just ‘hanging about’. A careful descent leads us to a magnificent Macaroni penguin rookery. Salisbury Plains - Salisbury Plain has one of the largest king penguin colonies on South Georgia. With about 100,000 pairs, the shore and beach can be completely crammed with penguins. Along the beach you will also find fur and elephant seals in the mix. Fortuna Bay & Stromness - Fortuna Bay is surrounded by high mountains with glaciers pushing down from the high country to terminate in the open valley that is home to a small king penguin colony. This is where Shackleton, Worsley, and Crean descended from the treacherous glaciers of the interior on their way to Stromness whaling station. Over the next few days a host of choices are open to us, and depending on ice and weather conditions, the western side of the Antarctic Peninsula is ours to explore. Our experienced expedition team, who have made countless journeys to this area, will use their expertise to design our voyage from day to day. This allows us to make best use of the prevailing weather, ice conditions and wildlife opportunities. Because we are so far south, we will experience approximately 18-20 hours of daylight and the days can be as busy as you wish. We will generally try for two landings or Zodiac excursions each day; cruising along spectacular ice cliffs; following whales that are feeding near the surface; and landing on the continent and its off-shore islands to visit penguin rookeries, seal haul outs, historic huts, and a few of our other favourite spots along the peninsula. There will be plenty of time for sleep when you get home! There are many exciting places we can choose to visit and our itinerary is deliberately flexible to allow us to pick the best spots on the day based on ice and weather conditions. A sample of some of the types of places where we may cruise through, land, hike, photograph or view spectacular wildlife include: Beautiful protected bays around the Antarctic Peninsula surrounded by magnificent peaks and spectacular glaciers, areas that are havens for whales as we keep our eyes open for humpbacks, orcas, minkes, and crabeater seals, as we explore bays in Zodiacs. Wildlife-rich islands where glaciers and mountains dominate the vista and we can see large chinstrap penguin colonies tucked in between basaltic turrets coloured by yellow and orange lichens, and where often fur seals and elephant seals are hauled out on the pebble beaches. Harbours home to gentoo penguins, and that regularly host Weddell seals. The scenery is dramatic towering peaks and calving glaciers surround the harbour. The thundering crack of the glaciers as they calve is sure to stop you in your tracks. Lemaire Channel - If ice conditions allow, standing on the observation deck of the Greg Mortimer quietly as the ship sails along the narrow Lemaire Channel could certainly be one of the highlights of our voyage. Cliffs tower 700 metres / 2,296 feet straight out of the ocean on either side of the ship. The water can sometimes be so still that perfect reflections are mirrored on the surface and it is clear to see why this Channel is often called “Kodak Alley”. Gigantic icebergs may clog the channel, creating navigational challenges for our Captain and crew; occasionally they may even obstruct our passage.